I’ve narrated a video on why Keynesian economics is bad theory, I’ve also narrated a video specifically debunking Obama’s failed stimulus, and I’ve put together a post with data from the Minneapolis Fed showing how Reaganomics worked far better than Obamanomics. But this video from the Center for Freedom and Prosperity Foundation does all that—and more—in only about six minutes. By the way, for those who like gory details, a previous video in the CF&P Foundation’s Economics 101 series looked at how the so-called stimulus was a rat’s nest of waste and corruption. Not that anybody should be surprised. Big government facilitates corruption in the same way that a dumpster attracts rats and cockroaches. My concern is long-term trends. 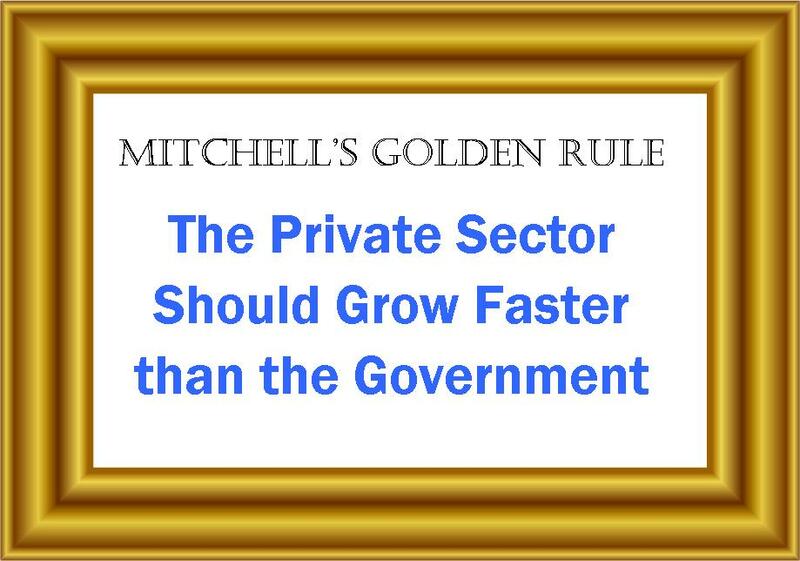 Politicians should be complying with Mitchell’s Golden Rule, which means reducing government spending as a share of GDP (to put it in terms that make economists feel warm and fuzzy, gov’t exp/GDP should be decreasing). What irks me about Obama is that he wants to increase the burden of government spending, which means the numerator in the equation is going in the wrong direction. And he wants class-warfare tax policy and more red tape, which makes it even harder for the denominator to move in the right direction. And if that ratio continues to deteriorate, as both the BIS and OECD are predicting, then it’s just a matter of time before the United States becomes Greece. Jay Greene has an excellent piece in the Wall Street Journal this week revealing that the teacher workforce has grown dramatically over the past forty years—and at enormous cost—without improving student achievement by the end of high school. And he rightly disparages President Obama for arguing that even more teachers would somehow do the trick. Even better, Greene notes that American education will not reverse its productivity collapse and become efficient until we allow it to benefit from the freedoms and incentives of the marketplace. But then Jay cites Governor Romney’s goal of “voucherizing federal education funds so that parents can take those resources and use them to send their children to schools of their choice,” and he does so with apparent approbation. Even ignoring the fact that the Constitution does not empower Congress to run education programs, this is a very dangerous idea. There has been no civilization in the history of humanity in which governments have paid for private schooling without ultimately controlling what was taught and who could teach, erecting barriers to entry and thereby crippling market forces. For that reason, I recommended against a federal voucher program under the Bush administration. Since then, additional evidence has come to light. When I studied the regulatory impact of U.S. private school choice programs last year I found that even the small existing U.S. voucher programs do indeed impose a heavy and very statistically significant additional burden of regulation on participating private schools. Perhaps a way will be found to enact and maintain minimally regulated voucher programs in the coming years. Until that time comes, it would be the height of folly to introduce a federal voucher program whose regulations would suffocate educational freedom from coast to coast. In my statistical study of choice program regulation, I found that K-12 tax credit programs do not impose a statistically significant extra burden of regulation on private schools. But even a national K-12 tax credit program would be far too dangerous. By leaving education policy to the states and the people, we can see which programs flourish and which become sclerotic. We must encourage and learn from that policy diversity, not squelch it with federal programs or mandates. Chinese telecommunications companies Huawei and ZTE long have been in the crosshairs of U.S. policymakers. Rumors that the telecoms are or could become conduits for Chinese government-sponsored cyber espionage or cyber attacks on so-called critical infrastructure in the United States have been swirling around Washington for a few years. Concerns about Huawei’s alleged ties to the People’s Liberation Army were plausible enough to cause the U.S. Committee on Foreign Investment in the United States (CFIUS) to recommend that President Bush block a proposed acquisition by Huawei of 3Com in 2008. Subsequent attempts by Huawei to expand in the United States have also failed for similar reasons, and because of Huawei’s ham-fisted, amateurish public relations efforts. So it’s not at all surprising that yesterday the House Permanent Select Committee on Intelligence, yesterday, following a nearly year-long investigation, issued its “Investigative Report on the U.S. National Security Issues Posed by Chinese Telecommunications Companies Huawei and ZTE,” along with recommendations that U.S. companies avoid doing business with these firms. But there is no smoking gun in the report, only innuendo sold as something more definitive. The most damning evidence against Huawei and ZTE is that the companies were evasive or incomplete when it came to providing answers to questions that would have revealed strategic information that the companies understandably might not want to share with U.S. policymakers, who may have the interests of their own favored U.S. telecoms in mind. Again, what I see revealed here is inexperience and lack of political sophistication on the part of the Chinese telecoms. It was Huawei—seeking to repair its sullied name and overcome the numerous obstacles it continues to face in its efforts to expand its business in the United States—that requested the full investigation of its operations and ties, not anticipating adequately that the inquiries would put them on the spot. What they got from the investigation was an ultimatum: share strategic information about the company and its plans with U.S. policymakers or be deemed a threat to U.S. national security. Now we have the House report—publicly fortified by a severely unbalanced 60 Minutes segment this past Sunday—to ratchet up the pressure for a more comprehensive solution. We’ve seen this pattern before: zealous lawmakers identifying imminent threats or gathering storms and then convincing the public that there are no alternatives to their excessive solutions. The public should note that fear imperils our freedoms and bestows greater powers on policymakers with their own agendas. Granted, I’m no expert in cyber espionage or cyber security and one or both of these Chinese companies may be bad actors. But the House report falls well short of convincing me that either possesses or will deploy cyber weapons of mass destruction against critical U.S. infrastructure or that they are any more hazardous than Western companies utilizing the same or similar supply chains that traverse China or any other country for that matter. And the previous CFIUS recommendtions to the president to block Huawei acquisitions are classified. Vulnerabilities in communications networks are ever-present and susceptible to insidious code, back doors, and malicious spyware regardless of where the components are manufactured. At best, shunning these two companies will provide a false sense of security. What should raise red flags is that none of the findings in the House report have anything to do with specific cyber threats or cyber security, but merely reinforce what we already know about China: that its economy operates under a system of state-sponsored capitalism and that intellectual property theft is a larger problem there than it is in the United States. And the report’s recommendations reveal more of a trade protectionist agenda than a critical infrastructure protection agenda. It states that CFIUS “must block acquisitions, takeovers, or mergers involving Huawei and ZTE given the threat to U.S. national security interests.” (Emphasis added.) What threat? It is not documented in the report. The report recommends that government contractors “exclude ZTE or Huawei equipment in their systems.” U.S. network providers and systems developers are “strongly encouraged to seek other vendors for their projects.” And it recommends that Congress and the executive branch enforcement agencies “investigate the unfair trade practices of the Chinese telecommunications sector, paying particular attention to China’s continued financial support for key companies.” (Emphasis added.) Talk about the pot calling the kettle black! Though not made explicit in the report, some U.S. telecom carriers allegedly were warned by U.S. policymakers that purchasing routers and other equipment for their networks from Huawei or ZTE would disqualify them from participating in the massive U.S. government procurement market for telecom services. If true, that is not only heavy-handed, but seemingly strong grounds for a Chinese WTO challenge on the grounds of discriminatory treatment. Before taking protectionist, WTO-illegal actions—such as banning transactions with certain foreign companies or even “recommending” forgoing such transactions—that would likely cause U.S. companies to lose business in China, the onus is on policymakers, the intelligence committees, and those otherwise in the know to demonstrate that there is a real threat from these companies and that they—U.S. policymakers—are not simply trying to advance the fortunes of their own constituent companies through a particularly insidious brand of industrial policy. I blogged previously about Mitt Romney’s claim that ObamaCare creates “an unelected board that’s going to tell people ultimately what kind of treatments they can have.” President Obama conceded the point when he responded that the Independent Payment Advisory Board “basically identifies best practices and says, let’s use the purchasing power of Medicare and Medicaid to help to institutionalize all these good things that we do.” The president admitted the whole point of IPAB is to let a bunch of experts decide what practices are “best,” and to stop paying for what isn’t. This is a myth advanced repeatedly by critics of the Affordable Care Act and debunked consistently by independent fact-checkers…the panel is explicitly prohibited from cutting benefits for people on Medicare. And there is no provision in the law that empowers the advisory board to make any decisions about what treatments doctors may provide for their patients. The media “fact check” business is incredibly tiresome given how pedantic and downright inaccurate it is, but I wanted to weigh in on this one before it hardens. The LA Times somehow thinks that the ACA (aka Obamacare) will have no effect on determining what care patients can get, and consequently dings Romney for saying it will. There isn’t a single honest health economist out there who agrees with the LA Times on this one. Bhattacharya explains that IPAB will be able to influence care by cutting payments to providers. But that’s not the half of it. IPAB has the power to do exactly what the fact-checkers think it can’t: deny specific treatments to Medicare enrollees. It can even raise taxes and do other things the fact-checkers think it cannot. I explain why the fact-checkers are wrong at this Cato Institute policy forum at noon on Thursday (October 11). Join us. Pre-register now at that link. Did Chávez Win the Elections? Is Venezuela a Democracy? The government disqualified leading opposition candidates on technicalities and through legal prosecution. Chávez used unlimited state resources to explicitly engage in his re-election campaign. For example, state television stations broadcast pro-Chávez propaganda, and government buildings display as much too. Capriles was limited to media appearances of three minutes per day, while Chávez appeared for hours at a time on all television stations as required by law. The voter registry included irregularities or was at least questionable. From 2003 to 2012 the number of voters registered increased from about 12 million to almost 19 million even though the population grew by only a few million during that time. 14 of 24 states in Venezuela have more registered voters than those eligible to vote. There are thousands of registered voters between the ages of 111 and 129. Voting ballots were printed in such a way that many people who thought they were voting for Capriles had their votes counted as being cast for a third candidate. Government spending increased by 30% over the past year; 8 million people are directly dependent in some way on government for their income or to receive handouts. Chávez closed the consulate in Miami, home to thousands of likely Capriles supporters, forcing them to vote at the consulate in New Orleans or become disenfranchised. The government intimidated voters, including government employees, by insinuating that their votes will not be secret. This is an incomplete list. Add to that the fact that Chávez controls every institution of government—including the military, the congress, the supreme court, the national electoral council, the national oil monopoly, etc.—exercises control over most of the media (including much of the private press, whose rights he’s violated), and keeps the private sector on a tight leash through capital controls and other forms of economic repression. The abuse of power has been well documented by the Washington Post, Mary O’Grady at the Wall Street Journal, The Economist and other sources. (See here, here, here, here, here and here). Venezuela stopped being a democracy long ago. That does not mean that the opposition’s campaign efforts were in vain. On the contrary, and in contrast to years past when it boycotted electoral politics, the opposition showed Venezuelans and the world the degree to which the regime would deploy dirty tricks, break the law, and otherwise undermine the election process—and still Chávez’s opponents achieved substantial support on election day. So did Chávez win the elections? I don’t think so, but the point is we don’t really know since the contest was hardly fair. We can only really say that in every important way, Chávez heads an authoritarian regime. Let’s not let the election exercise fool us into thinking otherwise.